​Eat fish, squid and crustaceans and drink seawater. Are the largest sea birds in the world - with a wingtip to wingtip length of approximately 3.2 metres. Spend most of their lives at sea and only come to land to make their nests. Nest in rookeries on cliff edges. Most are found in the southern hemisphere from Antarctica to Australia, South Africa and South America. The North Pacific albatrosses are found in the North Pacific from Hawaii to Japan, California and Alaska. 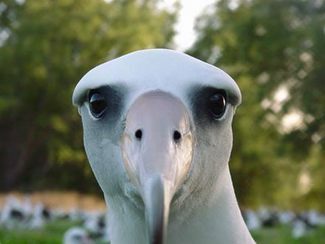 The Waved Albatross breeds in the Galapagos Islands and feeds off the coast of South America. Gets rid of the salt in drips from its huge 'tub-nose' and this makes it look as if it is crying. Because the albatross depends on the wind to fly, and sailors depend upon the wind to sail, the albatross became a good omen to sailors. Don't breed until they are about 10 years old and some are known to breed at the age of 60 years. Can sleep while it flies. Can fly around the world in less than 2 months. "There was a ship", said the mariner, as he commenced his sorrowful tale. A storm-blast “tyrannous and strong” drove the ship and crew deep into the southern ocean which was “wondrous and cold”, and full of sea ice. A great bird, an albatross came to visit the crew. A peaceful creature, the albatross came to the mariner’s ship often. The great white bird was a symbol of good luck for the seamen. This poem was written in 1797-1798.